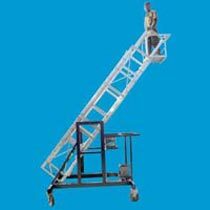 We are a known manufacturer of Tiltable Degree Variation Ladder with tilting facilities. This product is made from high tensile aluminum alloy that are strong, sturdy and long lasting. Alba Made from sides of “C” section and steps 1” Dia non slip corrugated tubing, complete with safety locks. Tool tray, safety gate, cage platform. Section -68.68mm X 31.75mm X 3mm. Steps- Aluminium Round pipe of 25mm at a distance of 300mm (12inch). Trolley Made from MS channel.Wheel - 8inch M.S Forged solid rubber wheels (2fix & 2 swivel) with Double ball Bearing., 4 parking jack will be attached to the trolley.